In the year 2019, a newly discovered “cure” to aging is given to protagonist John Farrell. The story follows him after his body stops maturing at 29 years old. Social change and issues arise as the cure gains popularity across the globe, leading to much political and moral debate. Members of the CSUN community are invited to prepare for this year’s incoming freshman class by reading and discussing the book with faculty and staff in a summer book group discussion. English professor Debbi Mercado will lead the discussion from 11 a.m. to noon on July 17 in Sierra Hall 439. All participants will be eligible to receive a free paperback copy of the book. Refreshments will be available. 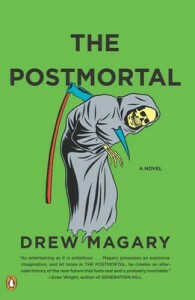 The book’s author, Drew Magary, will be the keynote speaker at the university’s annual Freshman Convocation on Thursday, Sept. 4. The Freshman Common Reading Program is part of Academic First Year Experiences, which strives to help freshmen and transfer students make a successful transition to CSUN. Programs such as the Common Reading Program and Freshman Convocation provide opportunities to link curricular learning so that first-year students begin university life smoothly. For more information about the Academic First Year Experiences program or to RSVP for “The Postmortal” book group discussion, call (818) 677-6535 or visit the Freshman Common Reading page.